Explanation: In 185 AD, Chinese astronomers recorded the appearance of a new star in the Nanmen asterism - a part of the sky identified with Alpha and Beta Centauri on modern star charts. The new star was visible for months and is thought to be the earliest recorded supernova. 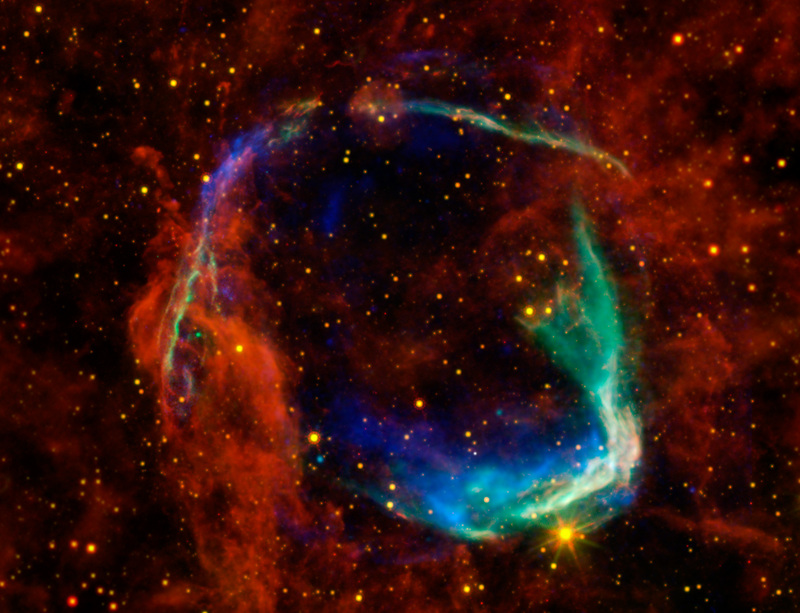 This multiwavelength composite image from orbiting telescopes of the 21st century, XMM-Newton and Chandra in X-rays, and Spitzer and WISE in infrared, shows RCW 86, understood to be the remnant of that stellar explosion. The false-color view traces interstellar gas heated by the expanding supernova shock wave at X-ray energies (blue and green) and interstellar dust radiating at cooler temperatures in infrared light (yellow and red). An abundance of the element iron and lack of a neutron star or pulsar in the remnant suggest that the original supernova was Type Ia. Type Ia supernovae are thermonuclear explosions that destroy a white dwarf star as it accretes material from a companion in a binary star system. Shock velocities measured in the X-ray emitting shell and infrared dust temperatures indicate that the remnant is expanding extremely rapidly into a remarkable low density bubble created before the explosion by the white dwarf system. Near the plane of our Milky Way Galaxy, RCW 86 is about 8,200 light-years away and has an estimated radius of 50 light-years.